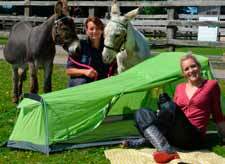 to Oakdown Holiday Park near Sidmouth are ready to welcome park guests for a VIP donkey experience. Guests staying at a top East Devon holiday park can this year enjoy a VIP donkey experience to raise much-needed funds for a local sanctuary. Oakdown Holiday Park in Weston is offering holidaymakers a behind-the-scenes introduction to the world of Britain’s largest equine charity. The Donkey Sanctuary, adjacent to the park, provides care for around 500 donkeys – many of which have been neglected, overworked or abandoned. In conjunction with the park, small groups will spend a hands-on morning helping the sanctuary team with a variety of tasks including grooming, walking, feeding and petting. The VIP package, priced at £38.00 per person, also includes a slap-up farmhouse cooked breakfast with a special gift for younger donkey devotees. Park owner Alastair Franks said: “Donkeys and mules are hardworking animals, and can also be very affectionate – but sadly, they are sometimes the victims of neglect and cruelty. “But these animals, as our visitors will see, are now leading happy and fulfilled lives in the care of dedicated volunteers who provide all the treatment and attention they need. “For children especially, this will prove a real eye-opener of a morning!” added Alastair.